DC Entertainment announced on Wednesday that its entire lineup of new titles are now available day-and-date for download via Apple's iBookstore for iPad, iPhone and iPod touch. DC's titles are also available from Amazon's Kindle Store, as well as the Barnes & Noble Nook Store. The company's lineup includes characters and series such as Superman, Batman, Justice League, Wonder Woman and Green Lantern. The move makes DC the only major comic publisher to offer its entire periodical lineup across all major e-bookstore platforms. Since the launch of its "New 52" lineup, DC's comics have been available digitally on the iPad day-and-date through its own application run by ComiXology, but Wednesday's announcement marks the first time the series have been available on Apple's iBookstore. "As e-readers and tablets continue to explode in popularity, it's important for us to offer consumers convenience and choice in how they download digital comics and graphic novels, and these new distribution deals with the top three e-bookstores do just that," said Jim Lee, co-publisher, DC Entertainment. "We're very excited to work with Amazon, Apple and Barnes & Noble to bring bestselling DC Comics and Vertigo periodicals to their e-bookstores." 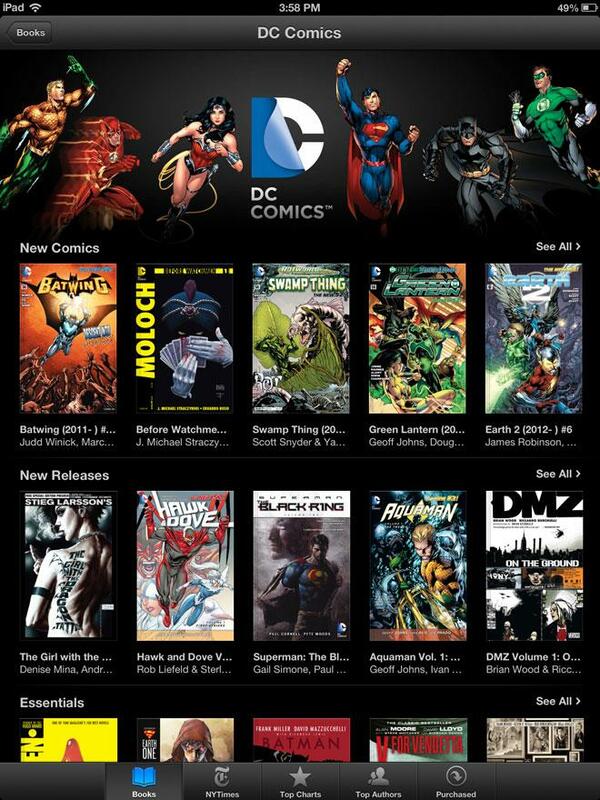 The addition of DC titles further expands the offerings on the iBookstore well beyond its initial start of mostly e-books. Since then, Apple has also placed considerable focus on offering digital textbooks through the iBookstore to push the use of the iPad in classrooms. While new titles will be available going forward on the iBookstore, some back titles are not yet available on Apple's digital storefront. DC Entertainment Senior Vice President of DIgital Hank Kanalz told CNet that their current absence is a "bandwidth issue," and that older titles should be available on the iBookstore in due time. As of Wednesday, a total of 70 DC titles are available through the iBookstore, including this week's New 52 superhero books along with some new Vertigo periodical titles. Also available are handful of "digital-first" titles that are available online before print, along with some back issues.